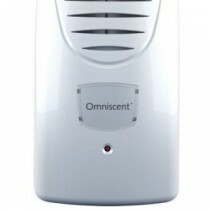 Omniscent® is a continuous fragrance system designed for large spaces that releases high quality fragrances continually and consistently, creating a positive user experience in areas such as hotels, gyms, casinos, reception areas, hotels and conference rooms. One unit will fragrance an area of up to 500 cubic metres. Omniscent® works by utilising ceramic cartridge technology instead of an aerosol refill, providing total user control of output and intensity. If you need further assistance please call our Customer Service Team on 01923 839 039.